I am back from our 12 day road trip down to Southern California! But another great magazine that was waiting for me to read was the latest issue of House of Fifty! YES! I love this ezine by the FABULOUS Janell Beals. This one is even better than the first! I have glanced at it quickly and all I can saw is WOW! Enjoy reading, since there is nothing exciting to read on my blog - such a slacker I am. Welcome home, Barbara! I look forward to hearing about your vacation. I agree... the new HOF mag is awesome! WElcome back!! I can't wait to take some time to look at the House of Fifty issue. Of course we missed you! And you are not a slacker. Everyone deserves a vacation! Haha, not everyone has seen this magazine and it is great! Thanks for featuring HOF on your blog today Barbara! Glad you enjoyed, such a fun venture this is proving to be! 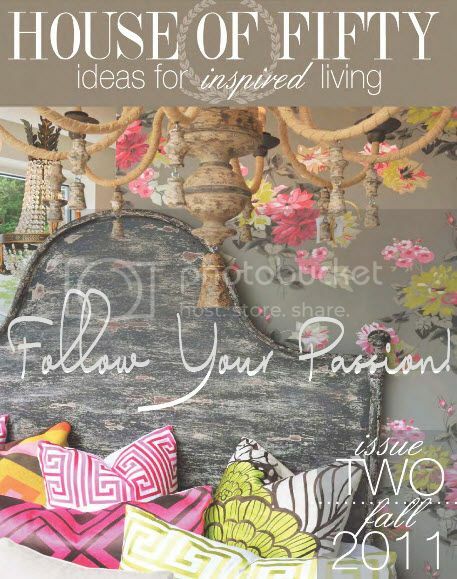 Beautiful magazine :-) Did you notice that Nancy's bedroom and side table were used an an example of eclectic design (pg. 57)?